Do you ever wonder, when an artist has released about 8-10 albums and has a body of work spanning at least a couple of decades, if they have any breath left in them? I often do. 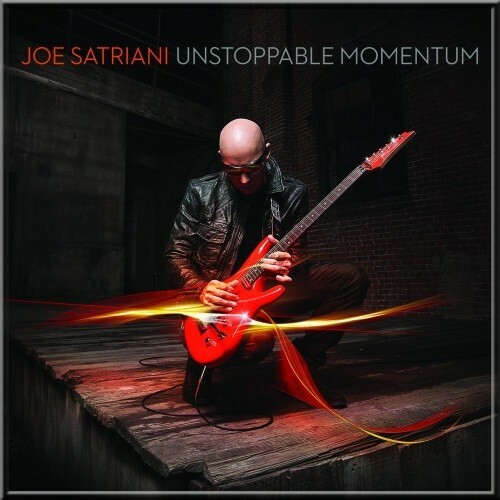 Unstoppable Momentum is Joe Satriani’s 14th studio album. Wondering how much breath he has left in him? It seems quite a few mouthfuls going by what he’s done here. Now, Satriani practically invented the guitar rock genre in 1987 with Surfing with the Alien and after 13 albums behind him and passing on his talent to the likes of Alex Skolnick and Kirk Hammett one would naturally expect his slow fade into the backdrop. On Unstoppable Momentum, he takes all your understanding and anticipatory forgiveness and discards it. The album cover is pretty cool too, who wouldn’t like a shiny red electric guitar in the hands of someone who’s literally a guitar magician? The album starts off with the title track and though it doesn’t actually pick up right away, it gets better. Satriani sounds exuberant and it shines through his playing from Unstoppable Momentum to Can’t Go Back. The sound engineering is neat and we have Mike Fraser to thank for that. Satch pulls off every note with precision making it seem like it’s the most natural thing in the world. Satriani has worked with Fraser again,who’s been the sound engineer for most of his albums. A long association like this only helps improve the quality of work between two talented gentlemen. Lies and Truths slightly changes the flow of the album with its sci-fi atmosphere and higher momentum. The bass on this song is particularly noteworthy. Satriani covers the rhythm section by getting Chris Chaney (of Jane’s Addiction) on board. Mike Keneally on keys is quite a delight despite the show of technical prowess because his melodies seem to be born of sheer musical motivation. Satriani definitely knows a good lineup. A Door Into Summer is undoubtedly the high point of the album and is the first single off this album. It is everything one knows Joe Satriani for and more – the uplifting melody, soulful playing and tendency to cause ceaseless foot-tapping. Shine On American Dreamer sounds like it’s been done before but it is nevertheless a great display of technical brilliance. The shuffles, melodies and chops are perfectly executed while Chaney and Vinnie Colaiuta on drums play together as if they’ve been doing it all their lives. Whether it is the arpeggiated chords or the stomps on Three Sheets to the Wind, the happiness on the record is hard to miss. How many times have Satriani fans felt the need for a vocalist? Guitar rock as a genre is exciting and displays the full extent of musicianship but has often been presided over by the fans’ need for a vocalist to grasp the flow of music completely. The most surprising thing Satch does is, completely eliminate that need on this record and that is not an easy thing to do. Every song is wholesome, has strong flow and a melody that’s easy to get a hold of along with short and simple sections that provide a breather to the untrained ear. This aspect is evident on Jumpin’ In and Jumpin’ Out. Satch is playful and these songs flow into each other seamlessly. The bass and Satriani’s parts are arranged cleverly on Jumpin’ Out and the overall effect is nothing less than delighting. Joe and his band don’t miss a step. The Weight of The World is one of the best songs on the album. The track easily progresses through chord changes and tones but then again, it’s what Satriani does. The seemingly simple change of tempo and tones are what really work toward binding the album together and providing flow. The ending track A Celebration is just that, a celebration. Clocking at just under 3 minutes – the song is happy, playful and paints a picture of the band smiling silly. It also reminds me of Ceremony (from the album Crystal Planet) albeit at a slower tempo. Unstoppable Momentum is one of Joe Satriani’s best creations since the 80’s and serves to remind everyone who the real guitar hero is. You can listen to A Door Into Summer here.